The leading manufacturer of graphics card by AMD, TUL Corporation, announced today the most affordable graphics solution with GDDR5 Memory in the value segment, PCS+ HD5550. The PCS+ HD5550 is embedded with the feature of the PCS+ series, and features an ultra quite 92mm cooling fan made of a low-noise impeller. This leads to a cool and low-noise environment measured under 30dB at load. The PCS+ HD5550 comes equipped with GDDR5 on-board memory, which means that the card easily boosts the performance and enhances data transmissions in up to 3.6Gbps. This delivers a superior gaming experience never before shown in the “value” segment. The graphics card will also come with default factory over clocked settings at 650MHz and 900MHz core and memory speed respectively. CEO of TUL Corporation, Ted Chen, explained that this is the very first time they are bringing the PCS+ series to the value segment, and that with superior over clocking ability and advanced GDDR5 on-board memory, the PCS+ HD5550 creates an out-of-the-box gaming performance. He also added that this will bring this value segment solution to a new level. Taking advantage of ATI stream technology, the PowerColor PCS+ HD5550 will increase productivity while accelerating the daily application and enhancing the working and entertaining efficiency in the consumer’s daily life. The graphics card supports the latest DirectX 11 and Windows 7, this providing a stunning high-definition entertainment experience. 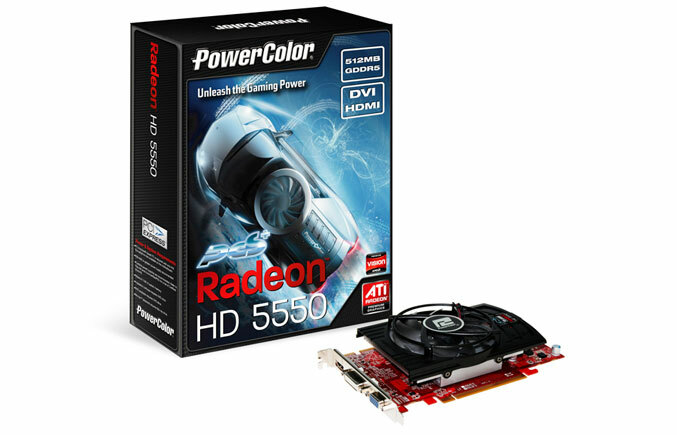 The PowerColor PCS+ HD5550 will be available on the 20th of May, 2010.